The Organisation for the Prohibition of Chemical Weapons (OPCW) is an intergovernmental organisation and the implementing body for the Chemical Weapons Convention, which entered into force on 29 April 1997. The OPCW, with its 193 member states, has its seat in The Hague, Netherlands, and oversees the global endeavour for the permanent and verifiable elimination of chemical weapons. The organisation promotes and verifies the adherence to the Chemical Weapons Convention, which prohibits the use of chemical weapons and requires their destruction. Verification consists both of evaluation of declarations by member states and onsite inspections. The organisation was awarded the 2013 Nobel Peace Prize "for its extensive efforts to eliminate chemical weapons". Nobel Committee chairman Thorbjørn Jagland said, "The conventions and the work of the OPCW have defined the use of chemical weapons as a taboo under international law". On 4 October 2018, the Dutch and British governments revealed that, in April 2018, intelligence officers of the Russian governmental espionage organisation Main Intelligence Directorate (GRU) conducted a cyber attack in an attempt to hack into the office of the OPCW in The Hague. The operation was disrupted and exposed by Dutch security services, and the four officers were deported out of the Netherlands. The activities of the OPCW and its core organisational structure are described in the Chemical Weapons Convention (whose members are all in OPCW). 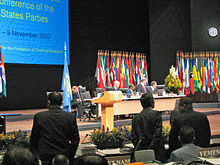 The principal body is the Conference of the States Parties (CSP), which normally is convened yearly, and in which all countries can participate, with equal voting rights. Countries are generally represented in the conference by a permanent representative to the organisation, which in most cases is also the ambassador to the Netherlands. The conference decides on all main topics regarding the organisation (for example, taking retaliation measures) and the convention (approving guidelines, imposing retaliating measures against members). The Executive Council (EC) is the executive organ of the organisation and consists of 41 states parties, which are appointed by the conference on a two-year term. The council amongst others oversees the budget and cooperates with the General Secretariat on all matters related to the convention. The Technical Secretariat (TS) applies most of the activities mandated by the council and is the body where most of the employees of the organisation work. The main activities of the OPCW are performed by the inspection and the verification divisions. The OPCW has the power to say whether chemical weapons were used in an attack it has investigated. In June 2018, it granted itself new powers to assign blame for attacks. At all operational chemical weapons destruction facilities, 24/7 inspections by the OPCW take place on site to verify the success of the destruction as well as the amounts of weapons being destroyed. In light of the hazardous environment in which the inspections take place, they are generally performed by evaluation via CCTV-systems. Inspections are designed to verify compliance of States Parties with the requirements imposed on production and use of scheduled chemicals and to verify that industrial activities of member states have been correctly declared according to the obligation set by the CWC. The intensity and frequency of the inspections is dependent on the type of chemical produced (in descending order: Schedule 1, Schedule 2, Schedule 3 or DOC, see Scheduled Chemicals), but is regardless of the standing of the member state. For Schedule 1 and 2 facilities, a mass balance is prepared to identify whether all produced chemicals can be accounted for and whether the amounts are consistent with the declarations made by member states. Furthermore, at Schedule 2 and 3 facilities clues are investigated whether, contrary to the declaration and to the rules in the convention, Schedule 1 chemicals are produced. At Schedule 3 and DOC, the main aim is to check the declaration and to verify the absence of Schedule 2 and Schedule 1 production units. The time limit Schedule 2 inspections is 96 hours while Schedule 3 and DOC inspections can take a maximum of 24 hours. There is no time limit on Schedule 1 inspections. In case of allegation of use of chemical weapons or the prohibited production, a fact-finding inspection can be employed according to the convention. None of those activities have taken place, although the OPCW contributed to investigations[when?] of alleged use of chemical weapons in Syria as part of a United Nations mission. The OPCW only undertakes these inspections on request of another member state, after verification of the presented proof. To avoid misuse, a majority of three quarters can block a challenge inspection request. The organisation is not an agency of the United Nations, but cooperates both on policy and practical issues. On 7 September 2000 the OPCW and the United Nations signed a cooperation agreement outlining how they were to coordinate their activities. The inspectors furthermore travel on the United Nations Laissez-Passer in which a sticker is placed explaining their position, and privileges and immunities. The United Nations Regional Groups also operate at the OPCW to govern the rotations on the Executive Council and provide informal discussion platform. The OPCW headquarters building was designed by American architect Gerhard Kallmann of Kallmann McKinnell & Wood. The Hague was chosen as the location for the seat of the organisation after a successful lobby of the Dutch government, competing against Vienna and Geneva. The organisation has its headquarters next to the World Forum Convention Centre (where it holds its yearly Conference of States Parties) and an equipment store and laboratory facility in Rijswijk. The headquarters were officially opened by Queen Beatrix of the Netherlands on 20 May 1998 and consist of an eight-story building built in a semi-circle. A permanent memorial to all victims is present at the back of the building and is open to the public. All 193 parties to the Chemical Weapons convention are automatically members of the OPCW. Other states which are eligible to become members are UN member states Israel, which is a signatory state that has not ratified the Chemical Weapons Convention, and Egypt, North Korea and South Sudan, which have neither signed nor acceded to the Chemical Weapons Convention. Palestine was the most recent state to submit its instrument of accession to the treaty. The Organisation is currently led by Director-General Ambassador Fernando Arias of Spain. The Director-General is directly appointed by the Conference for a maximum of two four-year terms. An overview of Directors-General is shown below. The appointment of Ambassador Arias followed a consensus recommendation by the OPCW Executive Council in October 2017. Ambassador Arias is a career diplomat with extensive experience in multilateral diplomacy. Previously, he served as Ambassador of Spain to the Netherlands and the Permanent Representative of Spain to the OPCW. He also has served as Permanent Representative of Spain to the United Nations in New York and Ambassador of Spain to Mali, Mauritania, former Yugoslav Republic of Macedonia, and Bulgaria. The first Director-General only served about one year of his second term, after which he was removed from office on grounds of lack of confidence by the member states. Some suspect that Director-General Bustani was forced out by the U.S. government because Bustani wanted international chemical weapons monitors inside Iraq and thus was seen as impeding the U.S. push for war against Iraq. The U.S. gave three main arguments for the removal of Bustani's from his position: "polarising and confrontational conduct", "mismanagement issues" and "advocacy of inappropriate roles for the OPCW". The removal was subsequently determined to be improper by an Administrative Tribunal of the International Labour Organization and consequently Bustani was awarded €50,000 in moral damages, his pay for the remainder of his second term, and his legal costs. On 11 October, the Norwegian Nobel Committee announced that the OPCW had been awarded the Nobel Peace Prize for "extensive work to eliminate chemical weapons". In the announcement, the OPCW and the Chemical Weapons Convention were praised. The committee further indicated how "Recent events in Syria, where chemical weapons have again been put to use, have underlined the need to enhance the efforts to do away with such weapons.” In the year ending September 2014, the OPCW had overseen the destruction of some 97 percent of Syria's declared chemical weapons. In 2014, The OPCW–The Hague Award was established to honour select individuals and institutions by highlighting their exceptional contributions towards the goal of a world permanently free of chemical weapons. The award was created as a legacy of the OPCW winning the 2013 Nobel Peace Prize. The OPCW—The Hague Award fund was created using the approximately €900,000 monetary prize which accompanied the Nobel Peace Prize, and is also supported financially by the City of The Hague, where the OPCW is based. ^ "Chemical Weapons - Organization for the Prohibition of Chemical Weapons (OPCW)". United Nations Office for Disarmament Affairs. Archived from the original on 2013-10-13. Retrieved 2013-10-11. ^ a b c d e "Organization for the Prohibition of Chemical Weapons (OPCW)". Nuclear Threat Initiative. Archived from the original on 2013-10-12. Retrieved 11 October 2013. ^ a b Cowell, Alan (11 October 2013). "Chemical Weapons Watchdog Wins Nobel Peace Prize". New York Times. Archived from the original on 2013-10-12. Retrieved 11 October 2013. ^ a b "Official press release from Nobel prize Committee". Nobel Prize Organization. 11 October 2013. Archived from the original on 2013-10-11. Retrieved 11 October 2013. ^ "Syria chemical weapons monitors win Nobel Peace Prize". BBC News. 2013-10-11. Archived from the original on 2013-10-12. Retrieved 2013-10-12. ^ "Persconferentie over verhinderen van Russische cyberaanval op OPCW". NOS (in Dutch). 4 October 2018. Archived from the original on 2018-10-04. Retrieved 4 October 2018. ^ "Nuclear Threat Initiative - NTI". Archived from the original on 2011-02-25. Retrieved 14 January 2017. ^ "OPCW by the Numbers". OPCW. Archived from the original on 2019-02-02. Retrieved 2019-01-31. ^ Sanchez, Raf (2018-06-27). "UK overcomes Russian resistance to strengthen OPCW chemical weapons watchdog". The Telegraph. ISSN 0307-1235. Archived from the original on 2018-06-27. Retrieved 2018-06-27. ^ "Chemical watchdog gets new powers". BBC News. 2018-06-27. Archived from the original on 2018-06-27. Retrieved 2018-06-27. ^ "List of new inspection equipment and revised specifications for approved inspection equipment". OPCW. Archived from the original on 2012-03-09. Retrieved 1 November 2010. ^ "The Intersection of Science and Chemical Disarmament". Archived from the original on 2017-01-16. Retrieved 14 January 2017. ^ "Australia's National Authority for the Chemical Weapons Convention". Australian Government, Department of Foreign Affairs and Trade. Archived from the original on 2011-03-26. Retrieved 31 March 2011. ^ Tom Z. Collina. "The Chemical Weapons Convention (CWC) at a Glance". Armscontrol.org. Archived from the original on 2011-04-21. Retrieved 24 April 2011. ^ United Nations General Assembly Session 55 Resolution A/RES/55/283 Retrieved 21 August 2007. ^ Hevesi, Dennis (2012-06-24). "Gerhard Kallmann, Architect, Is Dead at 97". New York Times. Archived from the original on 2013-10-12. Retrieved 2012-07-16. ^ "An Expat's View: Peter Kaiser". city of The Hague. 8 October 2009. Archived from the original on 28 September 2011. Retrieved 1 November 2010. ^ "HM Queen Beatrix of the Netherlands opens the purpose-built OPCW building". OPCW. Archived from the original on 21 September 2011. Retrieved 1 November 2010. ^ "Secretary-General calls chemical weapons memorial 'a symbol of suffering and hope'". United Nations. 9 May 2007. Archived from the original on 2012-11-03. Retrieved 24 April 2011. ^ "OPCW Member States". Opcw.org. Archived from the original on 2012-05-09. Retrieved 2013-10-11. ^ "Non-Member States". Opcw.org. Archived from the original on 2013-10-12. Retrieved 2013-10-11. ^ "Convention on the Prohibition of the Development, Production, Stockpiling and Use of Chemical Weapons and on their Destruction". United Nations Treaty Collection. Archived from the original on 2015-04-07. Retrieved 15 May 2015. ^ "Director-General". www.opcw.org. Archived from the original on 2018-07-30. Retrieved 2018-07-30. ^ "Technical Secretariat of the Organisation for the Prohibition of Chemical Weapons (OPCW)". Archived from the original on 2017-02-04. Retrieved 14 January 2017. ^ A Stanič (2004). "Bustani v. Organization for the Prohibition of Chemical Weapons". The American Journal of International Law. 98 (4): 810. JSTOR 3216704. ^ "Speech of Dr. Rogelio Pfirter, Director-General of the OPCW 16 September 2008". Netherlands Institute for International Relations. 22 September 2008. Archived from the original on 2011-07-21. Retrieved 24 April 2011. ^ "Ambassador Fernando Arias of Spain Appointed Next OPCW Director-General". www.opcw.org. Archived from the original on 2018-02-09. Retrieved 2018-02-08. ^ "Draft decision of the First Special Session of the Conference of the States Parties of the OPCW". Archived from the original on 2012-10-22. Retrieved 2013-10-11. ^ "Chemical weapons body sacks head". BBC News. 22 April 2002. Archived from the original on 2007-03-13. Retrieved 19 August 2010. ^ "Preserving the Chemical Weapons Convention: The Need For A New Organization for the Prohibition of Chemical Weapons (OPCW) Director-General". US Bureau of Arms Control. 2002-04-01. Archived from the original on 2013-10-13. Retrieved 2013-10-11. ^ "Chemicals weapons watchdog OPCW wins Nobel peace prize". Times of India. 11 October 2013. Archived from the original on 2017-10-11. Retrieved 11 October 2013. ^ "Global chemical weapons watchdog wins 2013 Nobel Peace Prize". Fox News. 11 October 2013. Archived from the original on 2013-10-11. Retrieved 11 October 2013. ^ Eaves, Elisabeth. "Ahmet Uzumcu: Getting Rid of Chemical Weapons in Syria and Beyond". Bulletin of the Atomic Scientists. SAGE. Archived from the original on 2014-10-13. Retrieved October 14, 2014. Wikimedia Commons has media related to Organisation for the Prohibition of Chemical Weapons.